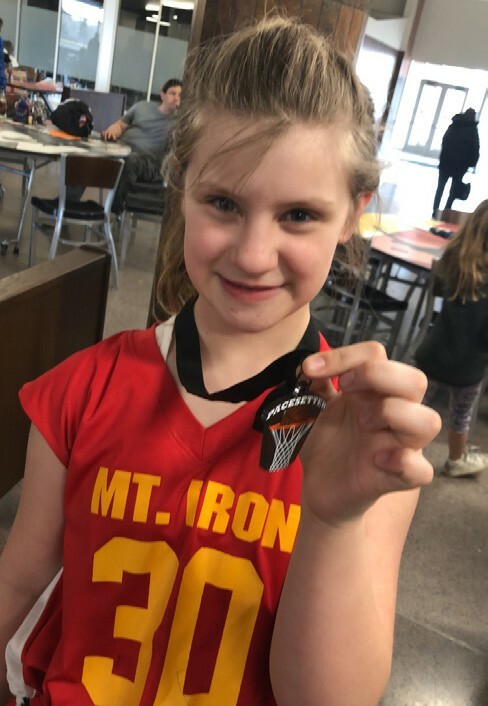 Maddy Unhjem is pictured with her Pacesetter Youth Basketball championship medal. Submitted photo. MT. IRON – Hi! My name is Maddy and I am from MI-B Merritt Elementary. Why I am writing [is that] my mom convinced me. Today I am writing about my team that won the championship game. Here’s how it started: We had three games and we won all of them and then we had one full game and then we had the championship game; it ended at 15 to 9 and we were screaming and hugging. My friend Sammie was crying because she made the last shot of the game. And then we got Fun Dip candy and a medal and a cupcake. My mom was so proud of me. Well. they are always proud of me all the time. Well I am done. Bye. Maddy Unhjem, age 9, is a third-grade student at Merritt Elementary in Mt. Iron. Other teams participating in the Pacesetter Youth Basketball Region 7 4th Grade Girls Tournament held on Sunday, March 31, at MI-B High School were Virginia, International Falls and Moose Lake/Willow River. Maddy’s teammates included Kylie Johnson, Mazie Buffetta, Lindsay Olin, Samantha Warwas, Peyton Kne, Lilly Francke, Jali Uglem, Maelee Petersen, Addysyn Salinas, Brenna Tiedeman, Althea Isaacson, Aubrey Johnson and Paiton Ross. Team coaches were Lauren Buffetta and Melissa Briski.